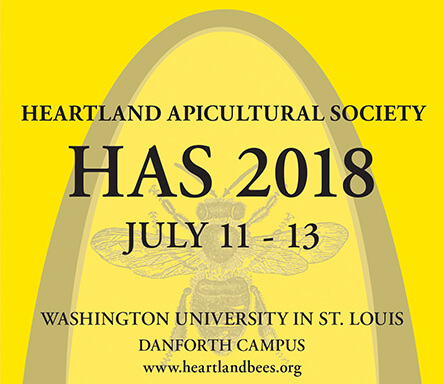 ST. LOUIS – Wednesday, June 20, 2018 is the deadline to register for Heartland Apicultural Society’s (HAS) annual conference this summer July 11-13, 2018 at Washington University in St. Louis, Missouri. Register online at www.heartlandbees.org. Established in 2001 by several professional entomologists, the conference rotates through the Midwest, offering beekeeping classes. This rotation in location makes it easier for local beekeepers to attend sessions focused on the latest beekeeping methods and research. This year’s three-day conference includes keynote speakers as well as hands-on apiary demonstrations, queen rearing sessions and beginning and advanced beekeeping classes. The conference will also include organized evening events including a Mexican dinner, live music and free movie night on Wednesday, July 11; a tour and buffet dinner at Anheuser Busch Brewery Thursday, July 12 and a private dinner and tour of the insectarium at St. Louis Zoo Friday, July 13. The University of Minnesota Bee Squad, an instructional beekeeping program will provide beginning and advanced classroom and apiary instruction. Confirmed conference speakers include Dr. Marla Spivak, a MacArthur Fellow at the University of Minnesota’s Bee Lab; Dr. Keith Delaplane, Director of the University of Georgia Honey Bee Program and ABJ columnist; Dr. Dennis vanEngelsdorp, University of Maryland Honeybee Lab, who directs the Bee Informed Partnership, the Tech Transfer Program and the annual national beekeeping management surveys; Dr. May Berenbaum, Entomology department head at University of Illinois Champaign-Urbana, whose research focuses on the chemical interactions between herbivorous insects and their host-plants; Jennifer Berry, University of Georgia Honey Bee program lab manager, and Dr. Samuel Ramsey, University of Maryland varroa researcher. Other national, regional and local beekeeping experts will also be participating in the conference.